Compost is waste turned into a resource. Yard and landscape debris make up more than 33 million tons of the municipal waste stream--which is compostable! With a small investment of time, you can contribute to the solution, improve your garden and save money on fertilizers and mulch. The ideal compost pile contains equal amounts of browns and greens (of varying sizes) placed in alternate layers. The brown materials provide carbon for your compost and the green materials provide nitrogen, while the water provides moisture to help breakdown the organic matter. Do not add glass, tin, plastic, cooked food, cheese, grease, animal feces, diseased plants or roots of perennial weeds. 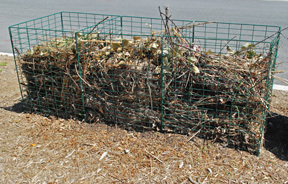 Compost bins are the most common method and can be purchased or built at home. 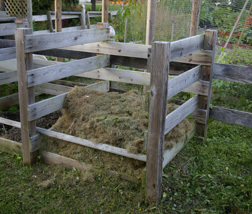 Add material through the top and within 10 weeks you can begin to remove rich compost from the bottom. 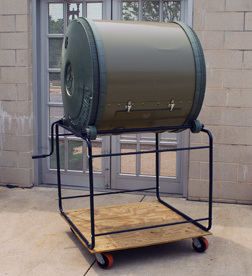 A compost tumbler is the fastest method and could produce compost within a few weeks. Just add the debris, water as needed, and give it a turn. The constant tumbling continually mixes the browns and greens, allowing them to break down more rapidly. Heavy gauge wire fencing is inexpensive and an easy, do-it-yourself project, though this method takes more time than the other examples. Place your enclosure in a shady spot and simply add your debris, moisten, leave it alone and watch it break down. Water weekly if it doesn't rain. You can speed up the process by turning the pile. To do this, lift the fence and place it on the ground in adjacent location. Starting at the top of the pile and working down, fork or shovel the pile back into the bin.